Following my last Mystery Photo (No. 27), which really did stray away from aviation, I thought I’d better come back to the fold. This image shows an early rotary wing aircraft carrying a gentleman in a rather unconventional sling lift. The year was 1944. It isn’t an RAN helicopter but it does have enormous historical significance. who was in the sling? We received quite a few correct responses to this photograph including from Kim Dunstan and Mark Lynch. All correctly identified the photo as a picture of Frank Erickson USCG lifting Igor Sikorsky in a sling fitted to a Sikorsky R4 helicopter. He was demonstrating the use of the winch to show that helicopters could be used for rescue work. The photo was taken in 1944. 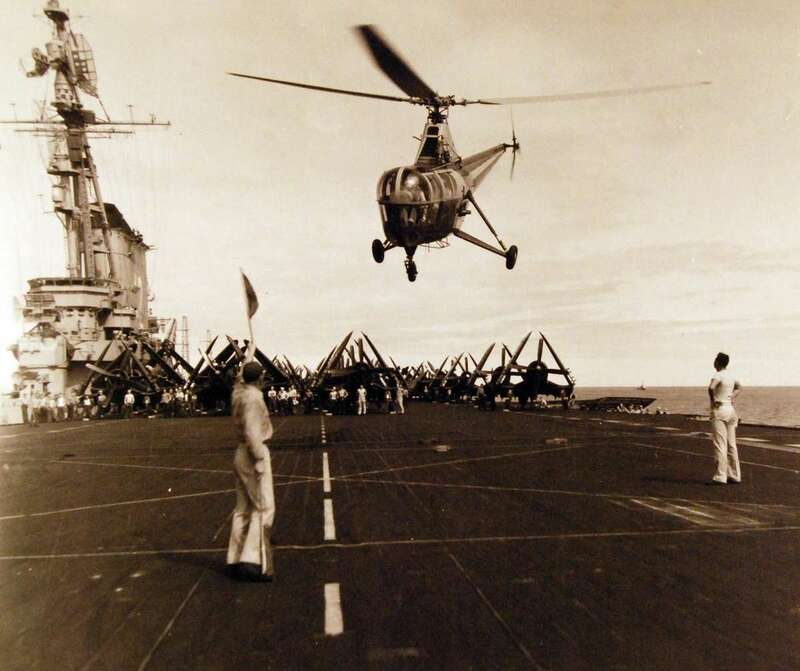 Although the USN did use helicopters at sea, they were typically in the utility role and were not fitted with a winch. Aircraft ditching during take off or landing on a carrier, for example, were attended to by a ‘plane guard’ ship (usually a destroyer or frigate) which held position astern of the carrier. 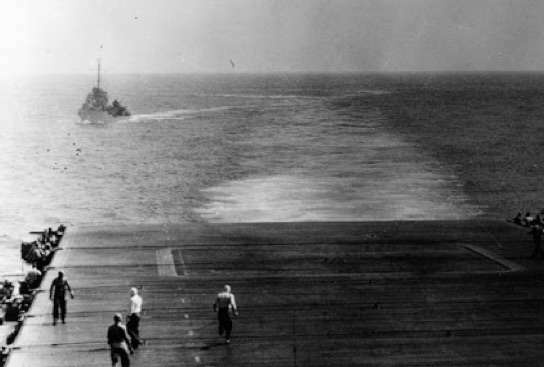 The photograph left shows the USS Monaghan manoeuvring into position to rescue LCDR Lindsey who crashed his Devastator while attempting to land aboard the USS Enterprise on 28 May 1942 (just prior to the battle of Midway). On 29 November 1945 a hoist equipped R5 piloted by Jimmy Viner rescued two crewmen off a barge around off Fairfield, Connecticut, but Navy did not proceed with rescue helicopters until they agreed to a trial by an S51 (see photo below). The first rescue by this aircraft was of LT Robert Shields on 9 Feb 47. A second followed shortly afterwards, with a further two before the end of that month. It was a compelling demonstration of the versatility of the helicopter for plane guard duties.